Hagie Manufacturing Company, located in Clarion, IA, optimizes customer growth by providing the most innovative crop protection solutions in the agriculture industry. After introducing the world’s first self-propelled sprayer in 1947, Hagie Manufacturing Company has continued to be a pioneer in the industry with innovations such as front-mounted booms, hydrostatic drives and hydraulically-adjustable booms. They’ve built a foundation with on family owned traditions and values around employees, customers and innovation inspiring sustained growth and success. 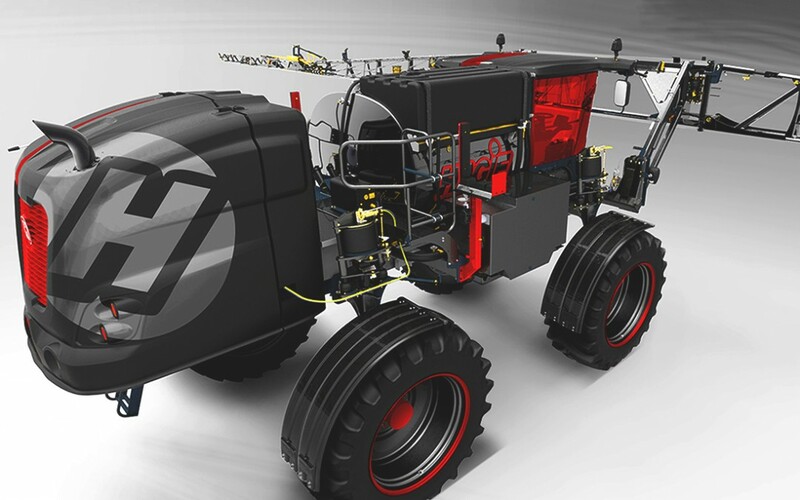 Through this, they design and manufacture the most eye-catching agriculture equipment you’ve seen, using KeyShot to present early project visuals and concepts throughout the design process. We talk with Super Senior Industrial Designer, Bryan Young, about what they do and how KeyShot has helped. 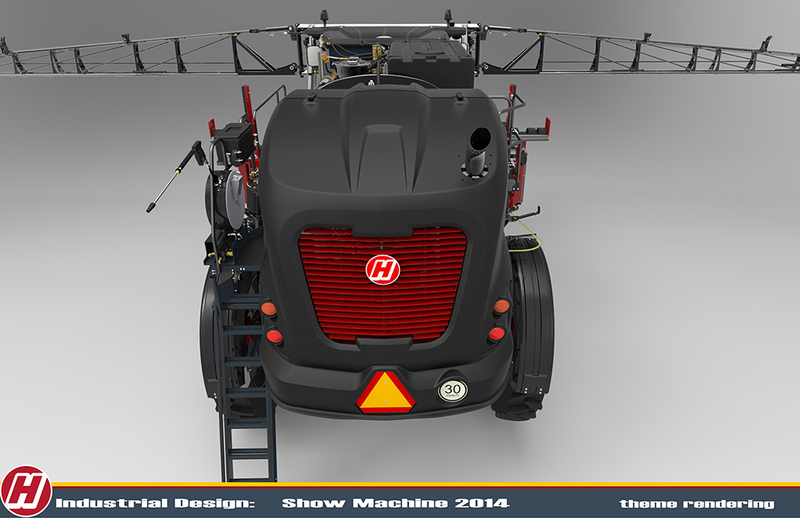 What does the design team at Hagie encompass? The Industrial Design team is fairly new to Hagie, being created within the past couple of years. I am responsible for managing and leading a small design team responsible for all exterior, interior and component design of the entire Hagie lineup of agriculture vehicle products. What are some project highlights? In our short amount of time, a project highlight has been establishing the Hagie VBL, or Visual Brand Language. This is being rolled out with the redesign of the current model range and additional models to come. 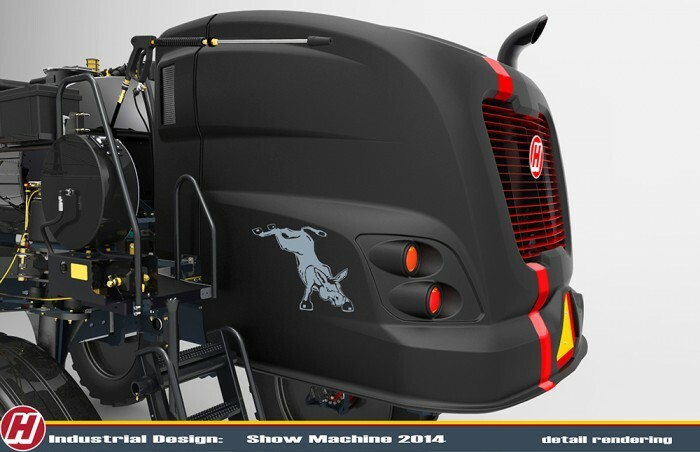 This can be seen in our volume seller, the newly redesigned STS line that was launched in 2013. Another project highlight I am proud of is the Black Widow show machine we are showing throughout the 2014-2015 farm show season. The usage of KeyShot was a huge factor in getting the approval to do this project. One in which I actually generated the KeyShot renderings. This type of project was something the company never did before in the 65+ year history, so having realistic images convinced senior management for project approval. Other project highlights are yet to come as my team and I are currently hard at work on them. Stay tuned. 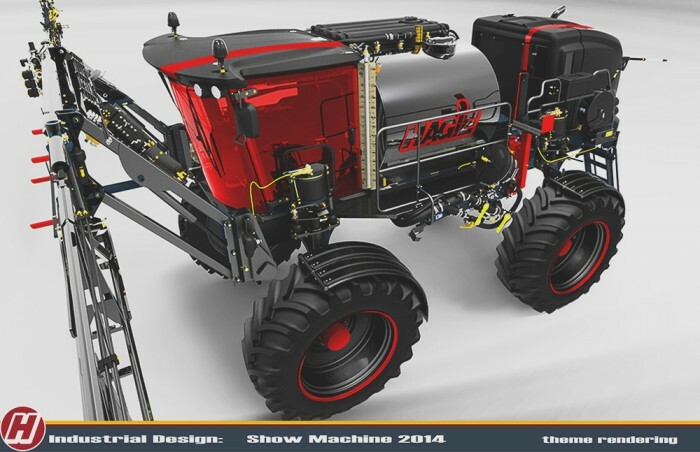 What would you say is unique about the design process at Hagie? The process is still evolving, so I am creating how the design process is integrated into the overall product development cycle. What is unique is having a CEO that is aware of the ROI that design brings and is open to design. My career before joining Hagie was in automotive, both OEM and supplier studios. So taking what I’ve observed at other studios and applying it hear is great. One example is at the start of a project during the theme generation stage I open it to the entire design staff. Whoever generates the hot theme is who we go with. This is unique because some studios will only have designers generating ideas. I find a competitive environment generates the best ideas. Where in the process is KeyShot used? Depending on the project requirements, KeyShot can be exclusively used in the beginning of the process. Example being the Black Widow show machine. KeyShot was the sole source of generating themes for that project. I require my team to use KeyShot throughout the design process. Since it’s hard for many of our non-creatives to envision concepts, KeyShot helps immensely. Before KeyShot any concepts or ideas required physically making them to see how they looked. Being able to visualize ideas and concepts in KeyShot has saved countless dollars for us and has allowed Industrial Design to show a multitude of ideas with minimum investment. I can’t tell you how much time, money and effort KeyShot has saved. It has allowed Industrial Design to generate concepts that our Product Development team has seen and actually integrating in products. What is one piece of advice or KeyShot tip you would pass along to other designers? My advice to other designers and design leaders is pretty simple. Use it. That’s it. No fuss no muss. I don’t consider an expert in it, but for me managing a design team, it is easy to learn and integrate within the digital design process, that I use it as often as I can. 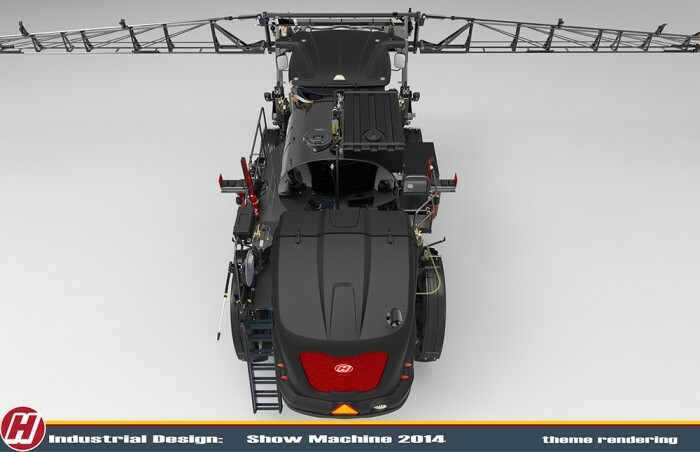 How has the KeyShot paid training program improved your understanding and use of the software? The paid training program greatly increased my design team’s understanding of KeyShot. The benefit of having training on-site was huge. Having the trainers see and drive our products, see the challenges we face and having face to face contact with our IT team was huge. You can’t get that by having off-site training. I would encourage any design teams to take advantage of the on-site training.